You've seen the challenge, you've flipped the bottle, now take it on the go. Flip the water bottle and land upright to score. How hard could it be? No internet connection required and no in app purchases. Produced in association with Inconceivable Ideas. This game is great, although it gets annoying and frustrating at times, it is still very enjoyable. I have a few ideas to make the game better and more fun. You get a coin every time you flip it and with coins you can buy different bottles, backgrounds and flavors of the water! That would be so cool. And I was thinking when you get 10 fireworks go off and same for when you get 20,30 so on! This app is a good timewaster for me when I'm bored. I love games like this where I can just listen to some music and play the game. I HAVE A SUGGESTION ALSO! There should totally be customization for the water bottle (like a punny version of a brand of soda, water, alcohol, ect,) and also for the table. They shouldn't be too crazy though! So, the idea of this amazing app is great. But it gets repedative. 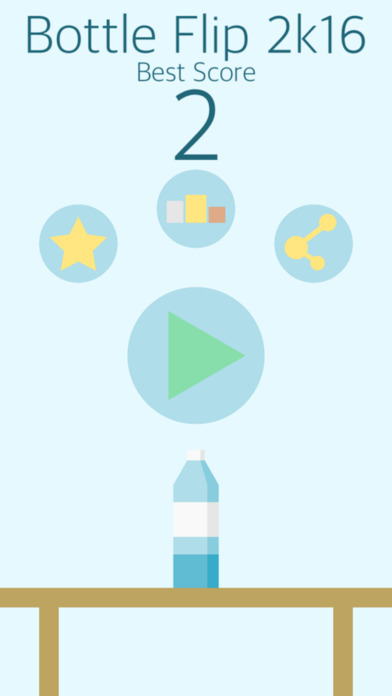 You ahould have levels, like flipping the bottle onto stairs and other objects. Also, I think you should add customization options to change flavors, water bottles, and backrounds. You could get these by flipping a certain amount of times. Not with coins cause then it will become an app with in-app purchases! !